The Hall of Fame award is presented to an athlete who has achieved to the highest level and is considered world class. The recipients have transcended the sport and are sporting legends. 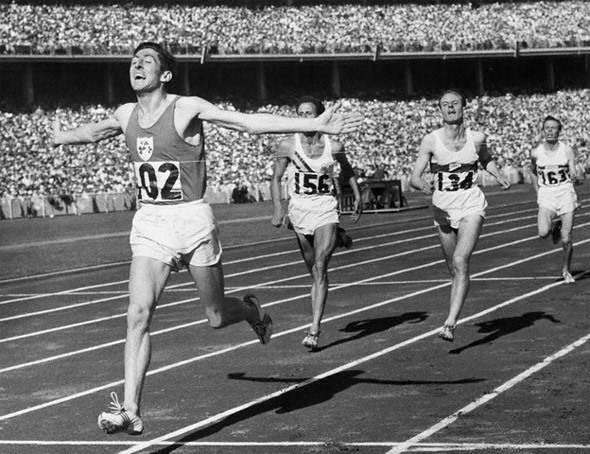 Ronnie Delany was just 21 when he breasted the tape to win the Olympic 1500m gold medal in Melbourne on December 1, 1956, but he had already gained a maturity and confidence beyond his years. Victory in that Olympic final was the realisation of a dream that was sown many years previously. The young Ronnie dabbled in many sports but he discovered his greatest talent was in athletics. “I discovered that I had a great talent in my 18th year, when I broke two minutes for the half mile. I did this in a senior race and suddenly here I was, just a boy, beating men," Delany recalls. Villanova University beckoned and his athletics career took on a new dimension when Ronnie teamed up with the legendary coach, Jumbo Elliott. He had also received excellent coaching at Crusaders Athletic Club in Dublin where another coaching legend, the late Jack Sweeney was in residence. But for Jumbo Elliott’s influence, Ronnie Delany might never have competed in the Olympic 1,500m as he had been essentially a half miler up to then. With just 180 metres to run, Delany made his decisive move. His natural speed carried him clear to breast the tape in a new Olympic record of 3.41.2. When he crossed the finish line with arms outstretched. In Melbourne in 1956, Ronnie Delany fulfilled his ultimate ambition. His Olympic victory remains one of the greatest of Irish sporting achievements. Delany, whose brilliant athletics career included an unbroken string of 40 indoor victories and a several indoor world records, remains as unassuming but totally positive as he was on that famous day in 1956 under the Australian sky.